Fiji's Metuisela Talebula is tackled by Australia's Bernard Foley and Rob Horne (left) during the Rugby World Cup match at the Millennium Stadium, Cardiff. PRESS ASSOCIATION Photo. Picture date: Wednesday September 23, 2015. See PA story RUGBYU Australia. Photo credit should read: Andrew Matthews/PA Wire. RESTRICTIONS: Editorial use only. Strictly no commercial use or association without RWCL permission. Still image use only. Use implies acceptance of Section 6 of RWC 2015 T&Cs at:http://bit.ly/1MPElTL Call +44 (0)1158 447447 for further info. Fiji's Waisea Nayacalevu is driven around the side of the pitch on a buggy after leaving the pitch injured during the Rugby World Cup match at the Millennium Stadium, Cardiff. PRESS ASSOCIATION Photo. Picture date: Wednesday September 23, 2015. See PA story RUGBYU Australia. Photo credit should read: Andrew Matthews/PA Wire. RESTRICTIONS: Editorial use only. Strictly no commercial use or association without RWCL permission. Still image use only. Use implies acceptance of Section 6 of RWC 2015 T&Cs at:http://bit.ly/1MPElTL Call +44 (0)1158 447447 for further info. Fiji perform the Cibi before the Rugby World Cup match at the Millennium Stadium, Cardiff. PRESS ASSOCIATION Photo. Picture date: Wednesday September 23, 2015. See PA story RUGBYU Australia. Photo credit should read: Andrew Matthews/PA Wire. RESTRICTIONS: Editorial use only. Strictly no commercial use or association without RWCL permission. Still image use only. Use implies acceptance of Section 6 of RWC 2015 T&Cs at:http://bit.ly/1MPElTL Call +44 (0)1158 447447 for further info. Fiji's Waisea Nayacalevu lies injured during the Rugby World Cup match at the Millennium Stadium, Cardiff. PRESS ASSOCIATION Photo. Picture date: Wednesday September 23, 2015. See PA story RUGBYU Australia. Photo credit should read: Andrew Matthews/PA Wire. RESTRICTIONS: Editorial use only. Strictly no commercial use or association without RWCL permission. Still image use only. Use implies acceptance of Section 6 of RWC 2015 T&Cs at:http://bit.ly/1MPElTL Call +44 (0)1158 447447 for further info. Australia fan cheers on his side in the stands before the Rugby World Cup match at the Millennium Stadium, Cardiff. PRESS ASSOCIATION Photo. Picture date: Wednesday September 23, 2015. See PA story RUGBYU Australia. Photo credit should read: Andrew Matthews/PA Wire. RESTRICTIONS: Editorial use only. Strictly no commercial use or association without RWCL permission. Still image use only. Use implies acceptance of Section 6 of RWC 2015 T&Cs at:http://bit.ly/1MPElTL Call +44 (0)1158 447447 for further info. 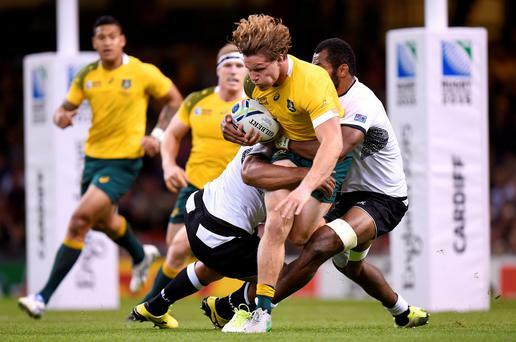 Australia's Michael Hooper (centre) is tackled by Fiji's Peceli Yato and Akapusi Qera (right) during the Rugby World Cup match at the Millennium Stadium, Cardiff. PRESS ASSOCIATION Photo. Picture date: Wednesday September 23, 2015. See PA story RUGBYU Australia. Photo credit should read: Andrew Matthews/PA Wire. RESTRICTIONS: Editorial use only. Strictly no commercial use or association without RWCL permission. Still image use only. Use implies acceptance of Section 6 of RWC 2015 T&Cs at:http://bit.ly/1MPElTL Call +44 (0)1158 447447 for further info. Fiji fans in fancy dress before the Rugby World Cup match at the Millennium Stadium, Cardiff. PRESS ASSOCIATION Photo. Picture date: Wednesday September 23, 2015. See PA story RUGBYU Australia. Photo credit should read: Andrew Matthews/PA Wire. RESTRICTIONS: Editorial use only. Strictly no commercial use or association without RWCL permission. Still image use only. Use implies acceptance of Section 6 of RWC 2015 T&Cs at:http://bit.ly/1MPElTL Call +44 (0)1158 447447 for further info. Australia and Fiji scarves on sale before the Rugby World Cup match at the Millennium Stadium, Cardiff. PRESS ASSOCIATION Photo. Picture date: Wednesday September 23, 2015. See PA story RUGBYU Australia. Photo credit should read: Andrew Matthews/PA Wire. RESTRICTIONS: Editorial use only. Strictly no commercial use or association without RWCL permission. Still image use only. Use implies acceptance of Section 6 of RWC 2015 T&Cs at:http://bit.ly/1MPElTL Call +44 (0)1158 447447 for further info.